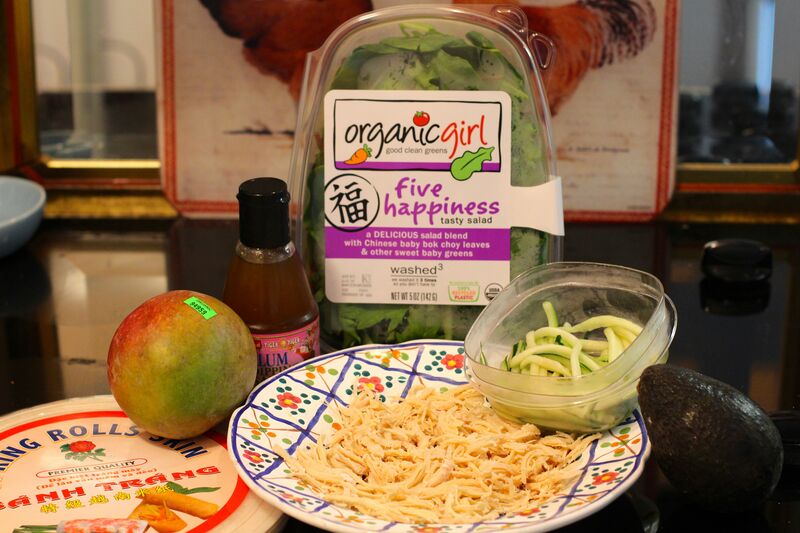 For a chance to win an Organic Girl Five Happiness Gift Package yourself…read on to the end. Now the mix on it’s own is incredibly tasty. Mama Sis and I have loved munching it down, but for the purposes of Zia’s Kitchen I wanted to come up with ways to use it that would entice the little ones of course. Now I will admit these are not super complicated, but sometimes simplicity is the best, especially when you want the flavors of the star ingredient to shine through. So after playing around I came up with two fun and incredibly easy recipes to use this yummy salad blend in. You can view the recipes and instructions here. First off I of course fed them to the little ones. For Ladybug I removed the ingredients as the rice wrapper is far to gummy and chewy for her at this point, and she ate the equivalent of an entire roll with gusto. Then I gave them to Littledude, hoping the kid-sized portion and bright color might distract him from the greens. Well Littledude is in a food “deconstructionist” phase, and he dismantled them and looked as if he would not be partaking. However when he tasted the plum sauce on the side, he became intrigued and began dipping – a kind word for the mess he was making - the ingredients in the sauce and eating them, INCLUDING some of the baby bok choy mix! Not a full blown hit with him, but he ate some and that’s a win any day of the week! Personally I loved them, then Mama Sis had a serving when she came home – which Littledude shared with her, and she proclaimed them delicious. Finally I had a few left over which I served to my friend Nina the next day when she came to visit. She also loved them, so all in all I think these little bites were a hit! Try them and trust me when I say these are so simple yet tasty. The hardest part is working with the rice wrappers. So I made these the next day while my friend Nina was visiting. Littledude was napping so the test run was myself, Nina and Ladybug. Ladybug ate two of them herself! She is really into her Zia’s cooking which makes me feel better because lately Littledude has become the all dreaded “Picky Eater”. I was far to overconfident that we were going to sail through his toddler years with him emerging as a junior gourmand…but alas no. He took one look and turned up his nose. Wouldn’t even try it. They were far to “green” for him. Sigh. However Nina, Mama Sis, a friend of Mama Sis, and Nonna all gave it two thumbs up at least! I will admit I felt that it could benefit from an accompaniment or a sauce. When I mentioned it needed a cool creamy sauce, Nina (who is greek) immediately suggested a Tzatziki sauce. BRILLIANT! I didn’t have the ingredients to make one but I am going to add that next time I make these Baby Bok Pancakes! That will be an experiment as well! 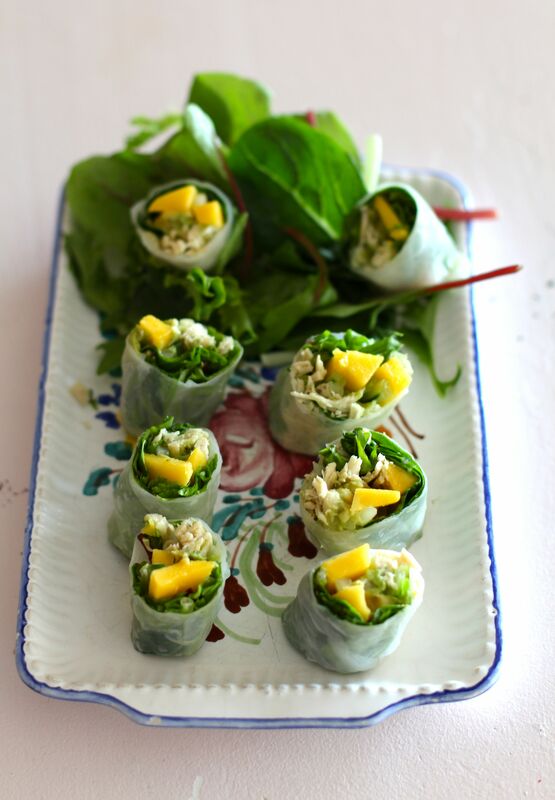 Once again check out my Organic Girl Greens Recipe Page and try them out! 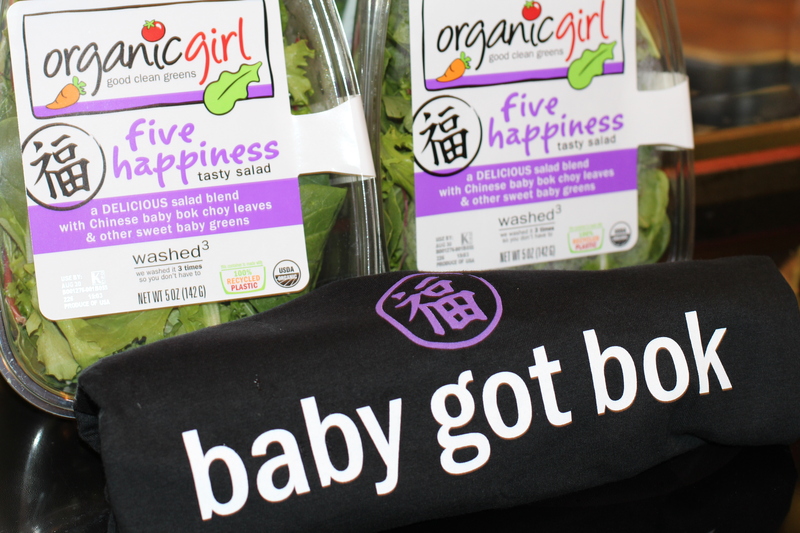 NOW – if you would like to win an Organic Girl Five Happiness Package for your family leave a comment below and let me know what your favorite leafy green is and how you like to prepare it AND follow Zia’s Kitchen. On Saturday August 31st FIVE people will be chosen to receive a FIVE HAPPINESS GIFT PACKAGE so you can try it at home. I will put the names in a hat and choose at random. It will help if you follow the blog so I can contact you if you are chosen as a winner. Remember to comment and follow by MIDNIGHT FRIDAY AUGUST 30th for the SATURDAY AUGUST 31st drawing. That sounds Nom Nom Rachel! You are entered for the drawing – good luck!! We love spinach! I add it to everything! We’ve been branching out to other greens as well. I love to use the #FiveHappinessBlend in a stir fry with coconut oil, five spice blend, ginger, ground mustanrd, a little low sodium soy sauce, peanut butter, bamboo shoots,water chestnuts, string beans, peas, and some pumpkin seeds and coconut on top! I like kale the best and usually as chips or a raw salad. The only leafy green I don’t like is swiss chard. And I keep eating it, hoping I will like it… it’s not working. I usually don’t cook my greens but after seeing these yummy recipes I have become intrigued. I would love to try one of these and see if the family partakes. For lunch today I cooked a salmon filet with wild and brown rice and sauteed Organic Girl Supergreens. When I plated my lunch, I first put about a half cup or so of the riced on my plate, then a layer of sauteed greens, then topped it with the salmon filet, lightly seasoned. Olive oil was used to saute the greens and to cook the salmon. Rice was cooked using home-made chicken broth from the bones of a rotisserie chicken. It was a very yummy lunch. I just discovered Organic Girl greens a couple of weeks ago. Have bought SuperGreens twice. Now I need to see if my grocer carries any other varieties! I love the Five Happiness Blend from Organic Girl… I have one some before but unable to get it from where I live. I made salads with mine and ate it with Basil Chicken.. YUM. Would love to get more. Hey Amanda! I’m anxious to read more of your recipes as perhaps I’ll find something my whole family will enjoy. We all have different tastes so cooking vegetables can be tough! My hubby and I can agree on a good romaine and baby spinach salad though! I look forward to following you!